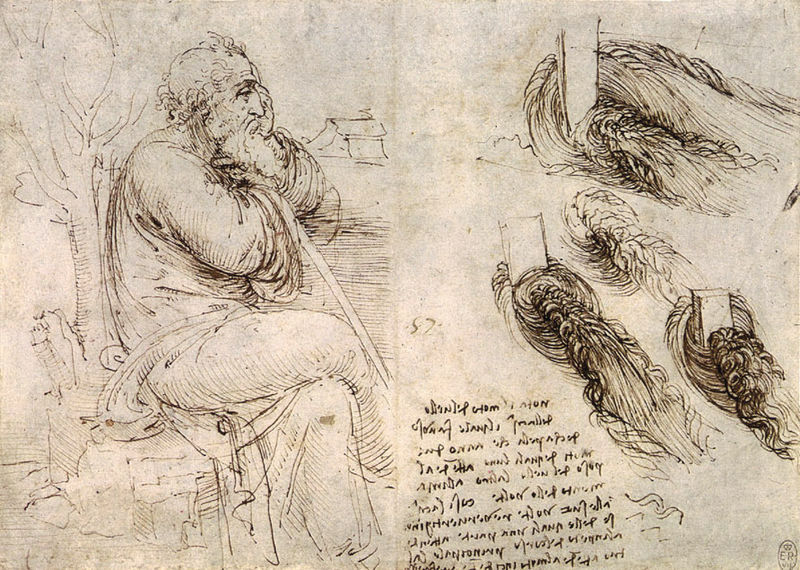 Leonardo da Vinci was an artist, inventor, engineer and scientist, but he also found time to write little fables for himself. In the margins of his notes he would pen short tales of how pride and envy would bring down a moth, tree or even a stone. Ever since Aesop’s Fables was written in ancient Greece, people have been sharing these short stories that illustrate a moral truth. They were popular in medieval times as well, with many writers explaining how misfortune stuck men, animals, insects and even plants and rocks. These fables are found in Leonardo’s notebooks from the years 1487 to 1494, when he was working in the service of Ludovico Sforza, Duke of Milan. They were written in the margins, perhaps as little notes to amuse or remind himself while he worked on bigger projects. Leonardo seems to have been interested in nature and finding examples of how various creatures would cause their own doom. In a dispute with water in a pot, the fire says that water should not stand above fire, which is the king of the elements, and it tries to drive the water from the pot by boiling it. The water, paying the fire the honor of its obedience, descends and drowns the fire. A citron tree grew proud of its beauty, and disdaining the plants around it, had them removed. But the wind, now striking it directly, uprooted it and cast it to the ground. When the fig tree had no fruit, no one looked at it. When it sought praise by bearing fruit, people bent and broke it. The crab hid beneath a rock to catch a fish that entered there. But flood waters caused the rocks to collapse violently, and the crab was crushed between them. The pen finds company of the inkwell both necessary and useful, for without the other neither of them is worth much. The farther the snowball rolled down the snow-covered mountain, the more it increased its volume. A stone of a good size, recently uncovered by rainwater, lay in an elevated spot where a pleasant grove above a stony road. Surrounded by herbs that were adorned by various flowers of different colors, the stone viewed the great number of stones lying in the road below it. It conceived a desire to roll down, and said to itself: “What am I doing here among these herbs? I want to live in the company of my fellow stones.” So letting itself roll down, it finished its tumbling course among the companions it desired. But after a while it began to suffer continual distress under the wagon of wheels, the hoofs of iron-shod horses, and the feet of travelers. Some of them turned it, and others trampled it. At times it raised itself up a little, all covered with mud or animal dung, and in vain looked back at the place it had left behind, a place of solitary and tranquil peace. This happens to those who leave the solitary and contemplative life and choose to live in cities among people full of countless evils. Being struck by the steel, a flintstone was quite surprised and said stiffly: “Why do you presume to trouble me so? Trouble me no more. You have mistaken me for someone else, for I have never hurt anyone.” The steel replied: “If you’re patient, you’ll see what marvellous results you can produce.” At these words, the flint resigned itself and withstood the torment patiently, and soon saw itself produce a marvellous fire, whose powers worked in a countless ways. This applies to those who are fearful when they begin their studies. Later, after they set out to attain mastery over themselves, and patiently give continual attention to their studies, we see them produce things of marvellous effect. The water that found itself in the proud sea, its own element, conceived a desire to rise up into the air. Aided by the element of fire, it ascended as a subtle vapor that nearly equaled the subtlety of the air. Then, as it rose higher, it passed into colder and subtler air, and was abandoned by the fire. Its small particles shrank, clustered, and grew heavy; as they sank, their pride turned to flight, and they fell from the sky. The water was then drunk by the dry earth, where it was imprisoned for a long time and did penance for its sin. You can read all of Leonardo da Vinci’s fables, and those of other Italian writers in Renaissance Fables, translated by David Birch – learn more about this book from the Arizona Centre for Medieval and Renaissance Studies.